Duct Booster Fans : Crawl Space Ventilation : Dryer Boosting : Tjernlund Products, Inc. Your Best Value for boosting air flow in ducts or for powered air intakes and exhausts. Residential and Commercial Sizes. Quality construction, Economically priced. 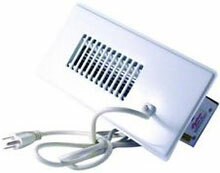 Boosts air flow in hard to heat or cool rooms. Models for ducts 5" through 14". 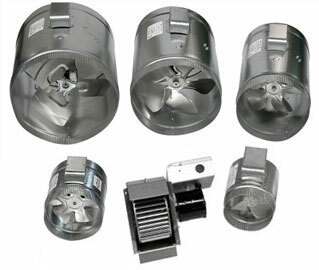 Models EF-6 through EF-14 may be used as exhaust or air intake fans. Easy installation in both metal and flex duct. Optional speed and Duct Airstat operating controls. Table is based on straight metal duct. 90 Degree elbows are equivalent to 10 feet of straight duct. Performance based on 70 degrees F. standard air. The DB-2 can be installed in round ducts up to 8", rectangular ducts as shallow as 3 1/4". The number after EF-matches the duct diameter. Example EF-8 connects to 8" round duct. For complete dimension and performance specifications consult factory. *EF-Auto Series include a built in pressure control for automatic operation. Versatile and durable Tjernlund M and P-Series Fans feature high pressure air handling performance with low noise and extremely low power usage. M-Series fans (metal housing) are ideal for long runs or air supply and exhaust applications requiring exacting performance. M-4 .9 100 3000 120 200 190 185 175 165 145 110 35 -- 4" 9 LBS. M-6 1.1 125 3000 120 530 510 490 465 440 375 310 175 -- 6" 13 LBS. M-8 1.8 210 3000 120 670 655 635 585 565 540 485 380 260 8" 15 LBS. M-10 2.1 260 3000 120 810 800 740 660 630 600 510 400 260 10" 16 LBS. Plug in speed control for use with M and P Series High Pressure Fans. Can be used with PS1503 Duct Airstat. RB-SERIES REGISTER BOOSTER FANS - For more comfortable rooms! Save on Energy Bills and Increase Comfort! RB-Series Register Booster fans are designed to increase the flow of heated air in warm air heating systems or cooled air in central air conditioning systems. These ultra quiet register booster fans are ideal when the duct run serving the room is not accessible to install a standard Tjernlund In-Line Duct Booster® fan. Requiring only about $5 per year to operate, the RB-Series includes power cord and built-in on/off switch. Plugs into standard 115 VAC outlet. Use optional SCP speed control or a remote on/off switch if desired. Register Booster fans are designed to increase the flow of heated air in warm air heating systems or cooled air in central air conditioning systems. These ultra quiet register booster fans are ideal when the duct run serving the room is not accessible to install a standard Tjernlund In-Line Duct Booster® fan. Requiring only about $5 per year to operate, the RB-Series includes power cord and built-in on/off switch. Plugs into standard 115 VAC outlet. Simply drop into your 4"x10" register and plug in. The unit can be operated manually or based on temperature. In winter, when the room gets too cold the unit will come on to draw more furnace heat to that room. In summer, when the room gets too hot the unit will come on to draw more air conditioning to that room. Click here for video. Installs flush with floor in seconds in any 3"x10" or 4"x10" register boot opening. Operates manually or automatically for any season with a built-in, hidden sensor. Features Sturdy Steel Construction and Grounded Power Cord. Built-in 45 degree turning vanes guide air to the center of the room. 20 Watt Low Energy Cross Flow Blower means its whisper quiet--no annoying buzzing like other fans. 45 CFM, about 300% of typical register air volumes.